The ferrule for the US hole cup in the main is 27mm in diameter and it is bigger than the UK ferrule. This helps the flag pin stand more upright. The ferrule for the UK hole cup in the main is 21mm in diameter. If you have a US ferrule it will only fit a US cup and if you have a UK ferrule it will only fit a UK cup. The diameter of the ferrule socket within the cup will determine if it’s US or UK. There are locking and non-locking ferrules but you will need a locking cup and locking ferrule to achieve this. Not all manufacturers are compatible with each other. 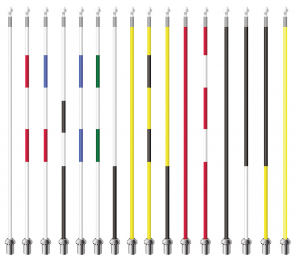 The ½” regulation pins are the same diameter from the bottom of the ferrule to the top. The lengths can vary from 6ft – 12ft depending on where they are to be located. They are generally made of fibreglass and the finish can vary depending on personal choice. For a high gloss effect, painted is generally favoured and for that extra durability sleeved. The tapered tournament flag pin or Javelin as it is also known as are normally used in tournaments as they have better visibility or on Links courses as they are heavier and less likely to blow out of the holes. They are normally around 7.5ft long with a diameter of ¾” in the middle tapering down top and bottom to ½”. Tubelock flags have a sewn plastic tube which fits over the flag pin which is then secured by the acorn nut. They are used with a tubelock system flag pin or American top as it is also known. These tend to fly better than tie on flags as the flag can revolve around the flagpin. Soft pocket flags have a strong canvas tubing which fits over the flagpin with a reinforced top grommet which fits over the flagpin top fitting and is then secured by the acorn nut. As they do not have a hard plastic tube like the tubelock flags they are able to be washed with mild detergent. They are also used with a tubelock system flag pin. Tie on flags have ties attached at the bottom of the flag so they can be attached to a D ring or spin system. Velcro flags have velcro ties attached so they can also be looped through the spin system and then the Velcro secures them to the pin. If it’s a locking system you want then you can’t get much better than the Standard Golf smart-fit locking system which comes with Standard Golfs NEW Smart-Fit Ferrule which has a polymer base to help prevent chipping cups or dulling the Smart-Fit finish. This ferrule comes as standard on all of our Royaline 1/2″ and TJ Golf Tournament flagpins, you will need either the US ST2000 holecup (plastic or aluminium) or the New hybrid holecup and any of our tubelock or soft pocket flags. Another good match for a locking system is the Pattisson Pro range. 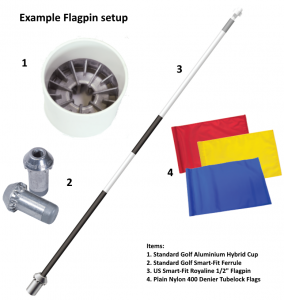 You will need the US Pattisson Aluminium Pro holecup, either Pattisson US Pro regular flagpin or the Pattisson US Pro Tournament flagpin along with any of our tubelock or soft pocket flags. For a non-locking system you can use our Standard Golf US Riji plastic cup, Standard Golf Aluminium US hole cup, Pattisson Aluminium US hole cup and Par Aide US Aluminium Everwhite hole cup. These are all compatible with the above mentioned flagpins and ferrules. If you are looking for something a bit more economical we now have a TJ economy flagpin. 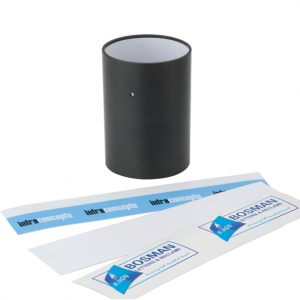 They are fitted with either a UK or US plastic ferrule and spinner system for tie on or Velcro flags. To go with these you will need either the UK or US Riji cup and either our 400 Denier Tie-On flags or 200 Denier Velcro flags. Matching your cups, pins and flags has never been easier……… as ever please visit our brochure page to see our full range of products.